MRI is especially valuable for differentiating septic arthritis from sacroiliitis as part of SpA. MRI is also valuable for the diagnosis of insufficiency fracture. 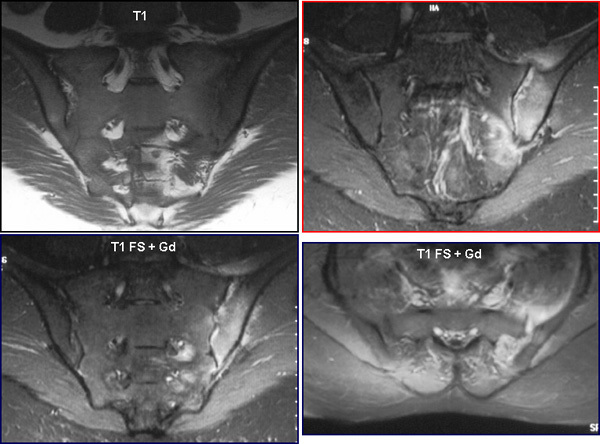 Septic sacroiliitis can be difficult to differentiate from SpA sacroiliitis by radiography, but MRI demonstrates oedema and contrast enhancement in the soft tissue around the joint, a feature not seen in SpA. 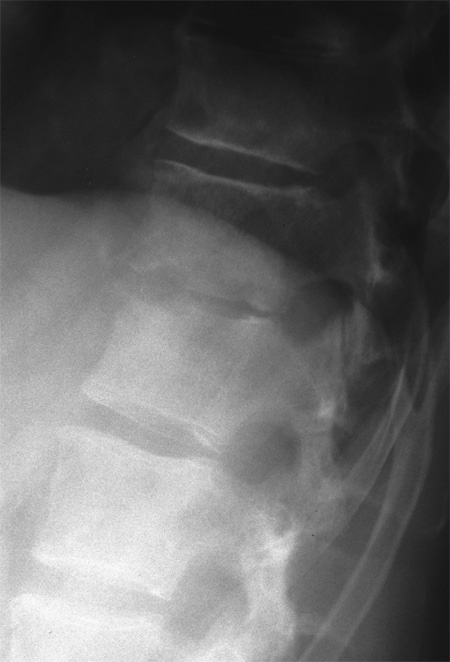 Radiograph showing blurred joint facets corresponding to the left sacroiliac joint. MRI revealed suppression of the fat signal around the joint on T1 and pronounced oedema and enhancement on STIR and T1 FS + Gd. involving both the joint region and the surrounding soft tissue structures. The soft tissue involvement is best seen on the semi-axial slice. Insufficiency fracture often involves the sacrum and sometimes also the adjacent iliac bone. 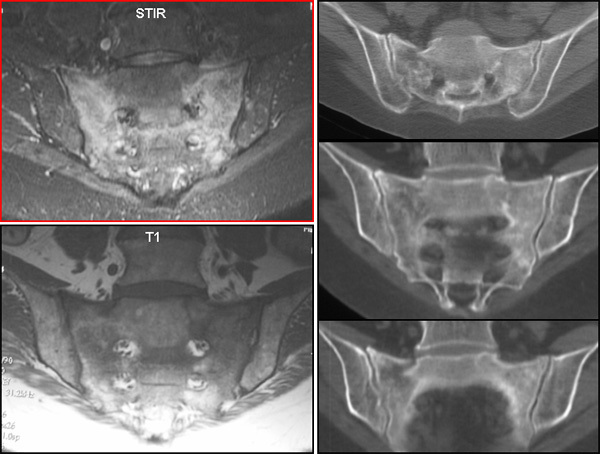 It can be differentiated from sacroiliitis by MRI or CT.
MRI showing pronounced oedema in the sacrum at STIR with dark intraosseous streaks on T1-weighted image compatible with insufficiency fractures. Multislice CT (images on the right) confirmed the sacral fracture lines. Degenerative and stress induced changes can be difficult to differentiate from sacroiliitis if there is concomitant bone oedema due to strain. Osteitis condensans ilii may by MRI simulate a quiet phase of SpA sacroiliitis. Then the diagnosis has to be established based on characteristic radiographic features, including osseous sclerosis but preserved joint facets. Ligamentous calcification seen in DISH may simulate inactive enthesopathy as part of SpA. In the illustration occuring proximally at the sacroiliac joint. MRI is especially valuable for differentiating septic spondylitis form SpA changes. 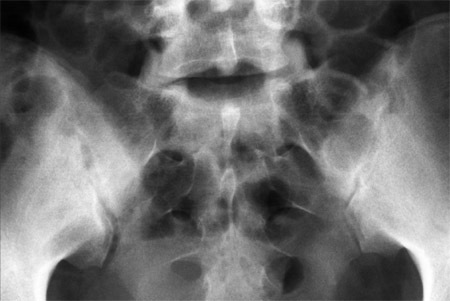 Radiography showing erosion of vertebral plates without subchondral sclerosis. 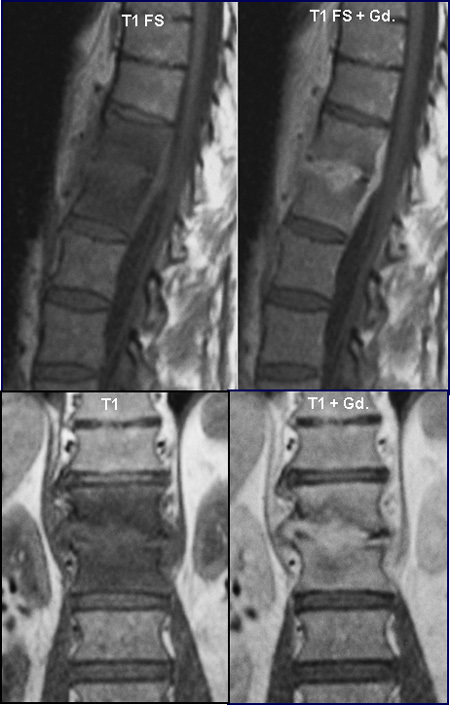 MRI demonstrating enhancing tissue within the vertebral disc in addition to enhancement of the surrounding bones compared to the pre-contrast images to the left. This is not a feature occurring in SpA. Disc degeneration may be accompanied by subchondral osseous inflammation and in later stages also fatty marrow degeneration. The changes often involve the entire subchondral area, but may predominate at vertebral corners (arrow) and can then be difficult to differentiate from SpA changes.